Sources say Sen. George Voinovich, a Republican from Ohio, will retire from the Senate. WASHINGTON (CNN) - Sources close to Sen. George Voinovich, R-Ohio, tell CNN he will announce Monday he is retiring from the Senate. The 72-year-old senator and former Ohio governor has been contemplating retirement for a while but made his final decision this weekend in Florida, where he was joined by his wife, children and grandchildren, according to one of the sources. Voinovich plans to serve out his term, which expires in 2010. He plans to make the announcement at 4 p.m. ET Monday in Washington, the source said. 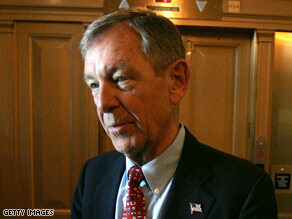 Voinovich will be the fourth Republican senator to announce he will not run for re-election in 2010. Sen. Kit Bond, R-Missouri, said late last week that we would retire, joining Sen. Mel Martinez, R-Florida, and Sen. Sam Brownback, R-Kansas, who had already announced they would leave Capitol Hill when their terms end at the close of the 111th Congress. Republicans must defend 15 incumbents and four open seats in 2010. (Sen. Kay Bailey Hutchison, R-Texas, whose term is not up until 2012, is seriously considering a 2010 gubernatorial bid and could also be vacating her seat early). Meanwhile, Democrats have to defend 15 incumbents and two seats where special elections are expected to be held. In Delaware, a special election will be scheduled for Vice President-elect Joe Biden's seat as well as a special election in New York should Hillary Clinton be confirmed as the next Secretary of State. Good, all these guys that have been in office for eons should retire . . . we wouldn't have a bunch of 65+ year olds using a public service job like a corporate job. Wow! And Obama appoints Leon Panetta, who's 71, and Ted Kennedy is 77, and Joe Biden is 66 - go figure! I'm not exactly sure how it became the norm where the Senate was meant to be an old folks' home. This man is 72 – how can he be considered suitable to provide competent governing when his viewpoints are from the 1950's? 1) Ohio Republicans have only been able to get ONE state-level candidate elected – State Auditor – since 2004. Democrats hold every other seat, including Governor, Lt. Governor, Attorney General, Sec. of State, Treasurer, and the state's jr. US Senator, Sharrod Brown. 2) As of 2008, Democrats now represent a majority of seats in Ohio's Congressional delegation for the first time in decades. 3) Democrats have just taken control of the State House of representatives for the first time in 14 years. Not only does this trend bode badly for Ohio Republicans (and is likely one reason that George Voinovich decided to retire) but, by virtue of its Ohio's dominant bellweather status, the trend also bodes poorly for Republicans nationwide. It is impossible for fair-minded guys like Voinovich to find a place in the narrow-mindedness of the Republican party. Right-wingers made his life miserable. Now that they are totally in control, there is really no place for him. Good luck, Senator. Wow... that's all I can say. The hate hear is incredible. We'll let the Dems have their time and then all of you will be screaming "off with their heads!" when the "one" and his pals don't come through. Anyone who wishes for a single party rule needs to leave the U.S. now. Go to Venezuela and see how Chavez is running things. Go to Russia or Iran or even Saudi Arabia and see how you like a single party system. Once a super majority has power, they can vote in rules and laws to keep themselves in power. Good riddance George. Please resign today. The only ones who will miss you are the warmongers in Israel and their cheerleaders around here. You leave a shameful legacy of public disservice. Good grief. I'd like to know how many of you fools who vent your anger at anyone and everyone have any civic virtue yourself? When was the last time you actually participated in the political process, volunteered, served your community? I am no fan of the Republican Party, but it does no one any good to drop every Republican into the Palin box, or worse the Bush administration box. There are Republicans with integrity, and lots of Democrats who lack it. What if everyone just called themselves Independents. Now, wouldn't that confuse the heck out of all you party poopers. slowly but surely the Senate needs to purge these old farts. I'm sorry, but at age 72 you should be enjoying the good life in retirement years. Same goes for Dems. Do you here me Ted Kennedy? Time for you to go too, and take some of your buddies with you please! Hey Jim @ 7:43 PM on 1/11: Shows how much you know. Illinois's election in 2010 is for a whole new term (since Obama's term would've ended in 2010), so it's a normal election, not a special election. The article did get the facts right. Who's a "genius" now? Great! Thats all this country needs is a democratic super majority. Higher taxes, more illegals, more dead babies, gay marriage, oil being bought from OPEC as opposed to drilling our own. Continuation of poor policy and lack of oversight on banking. Thats on he** of a platform to be able to win an election with. I guess the American public is as dumb as everybody says. Hey Pat! Steal another election you said? Another Republican bites the dust, soon King Obama can change the laws and be President forever, YES HE CAN.......CHANGE. Enjoy your short 4 year term, just like Jimmy Carter. Where is everyones job Obama, you are the man. Where is our money Obama, send me my check. More Goverment is the answer, spend all the money and we have no need for a Goverment, great idea. Time for the mandarins on the Democratic side to step aside. The election of PE Obama signaled a desire for a generaltional change. The Democratic Senators jockeying for power last week demonstrated that the desire for partisan, gridlock gov't still exists with the people who have "served" for too long. I bet you 2010 is going to be very different. Don't count on the Democrats picking up the seat. The foolish anti-GOP rhetoric from CNN and other extreme left media outlets will have let up on the hate. Hopefully that election will be run on actual policies and views on not on hate mongering and lies from the extreme left. Another one bites the dust. But seriously, Vionovich is the 4th Repub Senator to announce not seeking re-election, what's going on? Is it possible that these guys just can't fathom the thought of working with a Dem Pres and a Dem majority? Guess maybe bipartisanship is not their cup of tea.